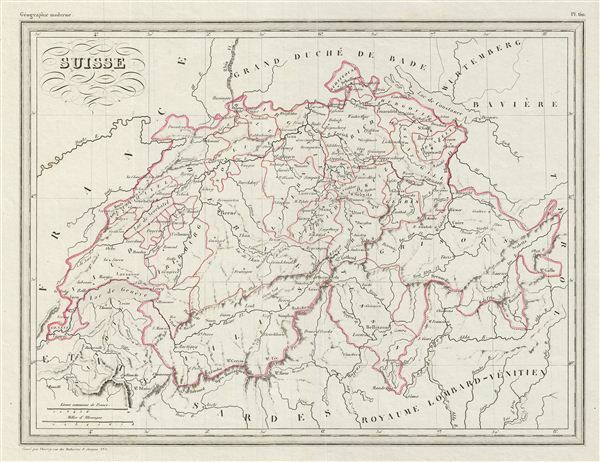 This is a fine example of Conrad Malte-Brun's 1843 map of Switzerland. It covers the entire country and shows the division by Cantons from Vaud to Grisons. As this map was issued, Switzerland was undergoing a rapid social and economic change known as the Regeneration Movement. Following the French July Revolution in 1830, the Swiss began assemble and call for fair representation and new Cantonal constitutions. Many of the cantons subsequently established representative governments and instituted freedom of the press and trade. Boundaries are color coded according to regions and territories. Various cities, towns, rivers and other topographical details are marked, with relief shown by hachure. This map was issued as plate no. 60 in Conrad Malte-Brun's 1843 Precis de la Geographie Universelle.